I have an old laptop at home, which over the years has taken quite a beating and has everything (including the kitchen sink) installed on it. As a result, it now takes the best part of 30 minutes just to boot up. I don't want to re-format the drive and re-install windows as there is a bunch of files and applications that I may need in the future and as I only really use it now for web-browsing and looking at photo's, I decided to use Puppy Linux – a small, live CD linux distro – to breath new life into the machine. However, there is no simple image browser installed in puppy – you know the kind of thing – file tree at one side, thumbnails the other and a big image view in the middle. "Now here is a good 20 minute project for LiveCode" I thought, so I set about writing such an application. What I wanted to create was a simple way to browse my photo collection – something that supported thumbnails (with a thumbnail cache for speed), folder navigation and was simple to use. The code is very heavily commented, so that you can take it apart for yourself and see how each part works. Just open it in Rev, bring up the Application Browser, and study the scripts for each part of the Image Browser. Rather than dissecting this application bit by bit I want to draw your attention to some of the concepts that are used. * The use of templateImage. * Using a "send " loop to allow responsiveness throughout the application. Sometimes it is very useful to set up a set of default values that you wish any newly created object to inherit – for example to set some default width or heights. LiveCode allows you to do this by the use of the template objects. Setting up the defaults on the templateImage (or any of the template Rev objects) allows you to specify default properties and behaviours for any newly created images. For more information about using template objects in Rev, see the Dictionary entries for templateImage, templateCard, templateGroup, and a number of other objects that have this property. One of the most powerful aspects of Rev is the way that you can code self contained objects or groups of objects. In this application the thumbnail group on the right hand side is a good example. Designing an application in this manner means you can copy the thumbnail group onto a fresh stack and simply call those two methods and the group will manage everything else for you. You will also need to copy the "status" group which provides the status bar etc. To look at the entire script for this group, click on the group called "thumbnailView" in the Application Browser, and bring up the script by clicking on "Script" in the toolbar. As you know, it is very easy to load images and resize them – and you would be forgiven for thinking that this is all that is required to create a thumbnail view of an image file. However, when you resize an image in Rev you still retain all the data that was in the original file. Although this will work, you will very quickly run out of memory if you try and load in thumbnails of a folder containing several hundred large images. What we actually want to achieve is to create a thumbnail that just contains that actual data of the smaller, resized image. This file can then be written out to disk to create a thumbnail cache. The easiest way to achieve this is to use the import snapshot command. Below you will find the main steps to achieve this. create image in group "thumbnailView"
import snapshot from rect (the rect of image "Foo") of image "Foo"
delete the last image	delete image "Foo"
You can see exactly how I used this in the Image Browser, the script is at the bottom of the "thumbnailView" group script, in the function called "processImage". Again, you can look up import snapshot in the Dictionary for more information on how to use this versatile command. However, doing things this way means that the application is locked up and unresponsive until all images have been processed – there is no-way to change folder, view an image or even cancel the listing until all files have been processed. Luckily, Rev provides a simple way to loop through the list while still allowing responsiveness to other events – the "Send" message loop. 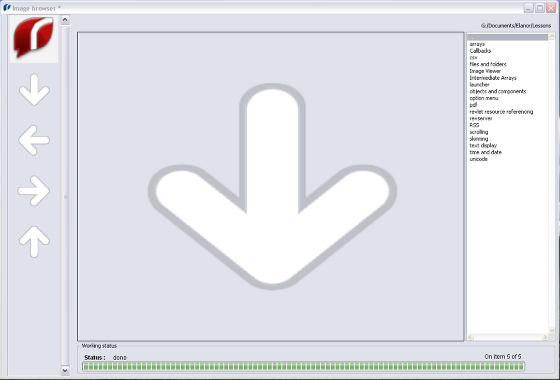 The "processImage" handler processes a single image file into a thumbnail (as outlined in the section above). The last thing the "processImage" handler does is call itself using the "send" command but with a small delay. This delay allows Rev to process any other events that may have occurred – mouse clicks on the folder tree for example. I downloaded the demo of this lesson and it only shows the name of the folders. There seems to be an issue using relative filenames for images, I have reported a bug and updated the example stack so it should now show the images. I downloaded the new version and on my Mac I continued without seeing the images. It recognizes the images that I have in the Desktop, 2 jpg and 1 png, but it does not show them. I also missed one place in the code where a relative filename was still being used for these existing thumbnails so I have uploaded a new example stack.